Worldwide shoes brand born in Argentina. More than 300 points of sales across USA, Europe & South Africa. They also set up the locations of the shops to trigger the geo-based notifications. PASSWORKS DISTRIBUTED THE CAMPAIGN THROUGH FACEBOOK ADS TO ACQUIRE NEW CUSTOMERS. Paez defined the target audience they wanted to reach to display the campaign. Customers downloaded the pass into their smartphone just by clicking on the Facebook ad. WHEN PASSING IN FRONT OF THE STORE, A PUSH NOTIFICATION WAS TRIGGERED, WHICH DRIVED THE CUSTOMERS INSIDE. 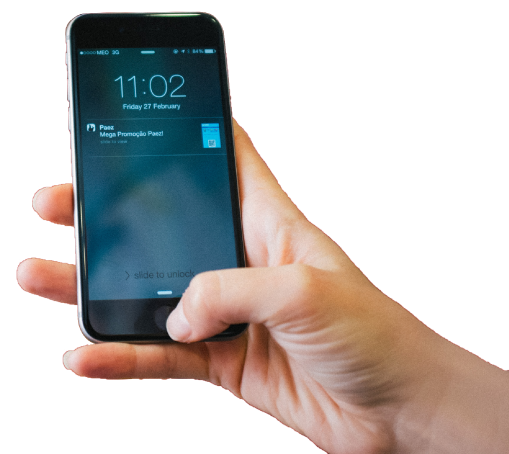 The smartphone displayed a geo-based push notification on the lock screen to remind of the Paez promotion. • The adoption of the campaign was above expectations, with 46% of customers who saw the campaign and installed the pass. • Campaign redemption was also above average with 29% of usage. • The pass is being updated with promotions, collections and also to announce the launch of a new store! 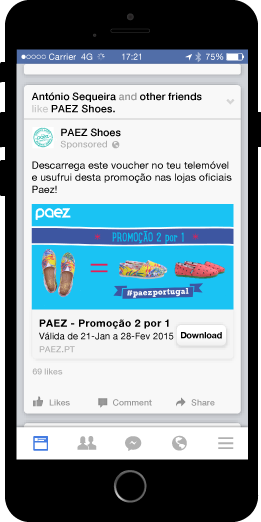 • More than a simple coupon, Paez sees this technology as a new communication channel to all upcoming promotions and an opportunity to engage with the customers by sending a push notification. • Long after the end of the campaign, with no push communication, the passes are still being shared among users.